The European Central Bank let it be known that it would help keep the credit spigots of the region’s banks open by offering some 490 billion euros in three year loans at its current reference rate of 1%. Note that the ECB did not simply dole the money out, nor did it fire up the Weimar Republic printing presses to accomplish this mission; less than 200 billion in ‘new’ money was hereby injected into the system. Nevertheless, the gesture was good enough to spark a mini-rally (and we mean smaller than Mini-Me) in commodities overnight, complete with gold reaching for the $1,640 mark for a while, as some perceived that the ECB loans might relieve some pressure on the gold leasing side of the market for a while. However, the rally was not very long-lived or full of energy. 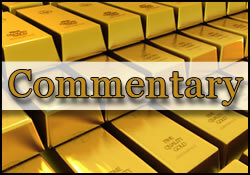 This morning, gold retreated to the sub-$1,620 area and silver went into negative territory once again. Crude oil was only ahead by 30 cents, the euro did not rise above $1.31, and the UD dollar climbed back above the all-important 80.05 pivot point on the trade-weighted index. New York spot metals dealings opened mixed for the midweek session this morning. Gold was down by $3 to start at the $1,612 mark on the bid-side, while silver was off by 16 cents at the $29.40 level. Gold’s half-hearted rally underscores the difficulties on the technical side of its current paradigm and it also likely points to thinning levels of market participation underway on certain metals exchanges. The condition will only intensify as we head into the next two days’ worth of trading action. After that, Santa takes over the stage and Monday will bring a market hiatus, to boot. Background market news this morning showed that Indian demand is lackluster as a weak rupee makes conditions difficult for local would-be bullion shoppers. Such buyers still appear to be holding out for better bargains in the days and weeks ahead. They appear to have parsed the Reuters’ poll of 20 pros who still expect sub-$1,500 gold within 90 days and no fresh highs until -at the earliest- H2 of 2012. Platinum fell $5 to $1,424 an ounce, but palladium gained $3 to open at the $628 figure per ounce. Rhodium remained static at $1,350 the ounce. On the noble metals’ side, analysts at Standard Bank note that Switzerland remained a net exporter of platinum for the sixth month in a row (32,814 ounces flowed out in November) but that exports to China have fallen rather dramatically. In the same month, Switzerland turned into a net importer of palladium (126,125 ounces) — a fact that points to relatively weak industrial as well as investment demand at this juncture. The supply-side continues to show that Russia is not yet struggling to keep the metal flowing from its supposedly fast-exhausting state-owned stash. If that stockpile is to fully run out, expectations now are that it might not do so until about one year from now. "Nice touch, ECB, but there is a whole lotta convincing left to do" is what investors appear to be saying this morning. As things became clearer in the wake of the ECB move, the markets showed that they remain skeptical on the issue of the size of the loans versus their eventual use. Thus, conditions in the region remain "foggy with scattered episodes of turbulence" as 2012 knocks on the door. China, too (a BFF for commodities), appears to be ushering in the coming year amid difficult conditions. Premier Wen stated that slowing growth and still-elevated-prices present a dual challenge for the country in 2012. "Prudent" monetary policy will remain on tap and China will certainly keep a wary eye on one of its largest export markets (Europe) in upcoming quarters. Meanwhile, probably on the back of such a fuzzy future for certain parts of the world, BNP Paribas scaled back its gold price forecasts for 2012 by $250 per ounce and its silver projections by $7 per ounce. One of the factors that prompted the revision was the expected vigor of the US economy and the less-than-rosy outlook of Europe’s. Actually, if Bank of America forecasters are proven correct, the commodities’ sector’s subpar performance in the coming year will make for a notable under-performance in emerging-market equities as well. India and Brazil stand to be losers from that developing situation. The CCI (Continuous Commodity Futures Price Index) has broken key support levels recently (as has gold) and the prospects for good performance by stocks related to at least those two nations have soured in the wake of the reduction in speculative positions by commodities’ players to a fresh, 31-month low. Note that 2011’s returns in the niche have already been anything but stellar; the MSCI Emerging Markets Index has fallen by 23% this year already, in a stark contrast to the assurances we were all given in January of this year by certain brokerage firms and permanently bullish commodity gurus. Similar expectations, including dollar strength, motivated Sharps Pixley analysts to opine that gold might encounter headwinds in the coming year which will make it less likely that the yellow metal will repeat its 2009/2001 annualized percentage returns performance. One other metric worth noting as we run the final stretch of 2011 is the one that reveals that global steel capacity utilization is running at a 24-month low. Consumers are running down inventory levels as the eurozone debt crisis has placed a damper on expectations about economic performance. Until tomorrow, keep running the inventory levels at your nearest mall lower. Only four days left to pull that off…and counting.